In what seems to be a theme for me, this is a book about existing in a post-apocalyptic, plague-ravaged world. Thankfully, as part of this book being heaps and oodles better than The Twleve, it is not only a more well-considered and well-written book, when women’s biology is addressed it’s much less exploitative. Having a female author helps with that. Let me back up. Severance centers on a millennial woman named Candace. She works at a publishing house in New York, has an apartment in Brooklyn, and has no purpose or even call for purpose. She does her work, she goes home. She’s a first generation immigrant who lost her parents young, a job she does but doesn’t enjoy, and a serious boyfriend she doesn’t seem too torn up to lose. When Shen Fever descends and decimates populations and New York just empties out, her company asks her to stay on in an emergency capacity to hold down the fort, with an enormous payout on the prescribed date they figure they can be back. Candace agrees – not because of the money or not because she underestimates the fever, but because she really has nothing better to do. And so the end of the world unfolds. Running parallel is the “present day” storyline in which she has found another group of survivors heading for The Facility – an eden promised by their seriously cult-y leader. That was less interesting to me than watching one woman tie herself to routine as strongly as possible even as the world crumbles around her. When her office shuttle stops running and she has to take a taxi, she moves in to her office (well, into her boss’s office. He has the best furniture. And a skylight). 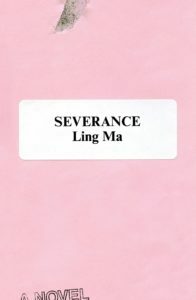 Severance is a book that dwells in the mundane and in our adherence to the known in the face of the unknowable. The “fevered” of this book aren’t violent or dangerous to the uninfected. They simply exist, living out their small routines every day until their malnourished bodies collapse. It’s a fascinating study of monotony, even if that sentence makes no sense. Share the post "The dangerous lull of monotony"
Oh, so glad to see more love for Severance. I agree with you that the “present day” scenes were less compelling than Candace just doing her thing.